Thanks, added all the dialog to the NPC page for the Grand Historian. For the longest time, I avoided the Hollows instances due to the Alla's Zone level Chart putting min level at 60. These are instanced as low as 45? Could we get the Zone level Chart adjusted? Also, from reading posts in the Sewers and Catacombs section, those instances appear to be scalable from 55 or so but also show 60 as the min level on the Chart. Dranik's Hollows A is also known as Watering Hole, for those who want to know before zoning in. All faction hits in this instanced zone are Denizens of Discord. how do you get out of it?I did the murk.Couldn't zone out.I tried clicking on every wall at zone in there was.Ant idea? zone out is a pile of rocks. Can anyone help me out with this pls? My group consisted of 2 lvl 70's and a lvl 69 and all the historian would give me was the Watering Hole instance. What lvl does the leader need to be in order to get the Firepits instance or is there a way to determine which instance I want and actually get that one? I once tried shrouding down to 65 but got the Hive one instead, iirc. Can anyone give a breakdown please of which instance will be spawned by each lvl or is this completely random? Thanks. The specific instance is not dependant on level. You just need to drop the one you get, and retry until you get fire pits. It might take 10 tries, but that's how it works. Doing Signets tonight and was told to try Firepits. PH is "a dragorn peon" which is in the small round room just before the L room at end of zone. Its the peon on the right as you come into the little room. I apologize if you see this post twice...I posted it somewhere else in error. Still a little confused about these expeditions. One person wrote that you need a min of 3 people to get in (although 2 can drop out and the last one left can solo) and someone else wrote that they are like ldons. Does this mean that the mob levels also fluctuate based upon group level - ex. if 3 level 58s enter, then the mobs should be tailored to accomodate those levels? Also, like ldons - are these expeditions tailored to a group of 6? Thank you. Draniks mobs are light blue and am looking for the next place to go at lvl 58. It would seem that you've got it right. Like LDoNs, these expeditions are scaled for full groups of certain levels, in steps; the zones are instanced and need 3 people in group to get it started. Unlike LDoNs, though, the mobs do respawn, and there is no set "goal" to achieve. The zone stays as long as you want it. IF you're still around 58-60, try the first ravine in Noble's, or if that's too difficult go to Harbinger's Spire or try Bloodfields. when you talk to the instance giver, the character you do it with is the one that the instance is set up for. But you need 2 other folks in your group for him to give you an instance. So if you wanna solo or duo, get 2 others in your group and if you own the DoD expansion you can shroud down with the character trying to get the instance, and the instance will be created for the shrouded level. Then enter the instance and enjoy. I went back to the Murkglider Hive level 68 expedition a few days ago. Now the rats and bats aggro. Some murkgliders see through invis. It is no longer possible to move around the hive freely with Invisibility versus Undead. We were fighting in the Watering Hole Hollows for a 65 leader and this dropped: Tome of Dranik's Bloodmagic Page 1..... it dropped from a commoner and is no-drop... anyone have an idea what it is for? RE: New Item or Trash? Yes. Had same thing. Dropped off of 2 different mobs. Was lvl 66 grp. Any ideas? Do Yellowfang and the Swaying Murkglider share the same PH (i.e. : a hideous rat)? I camped here the other morning, and got the murkie and the swooping to spawn, but never saw the named rat...guidance, please? If nothing else, this seems a solid way to bump up the FT on twinks, as well as retro-fitting EP gear to rid yourself of sub-par FT gear without dropping your FT.
A tatterwing bat is the ph'er for Yellowfang. This is with lvl 62 requesting the Expo. 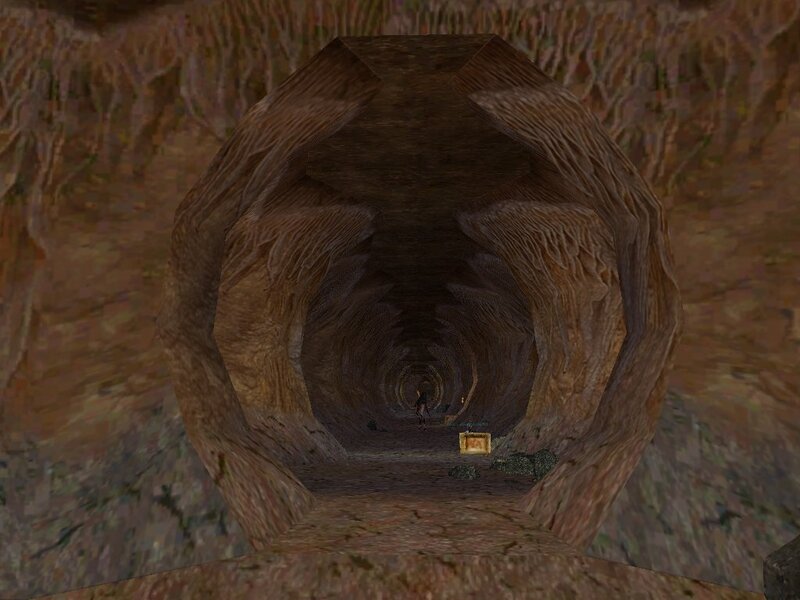 It was just past the a hideous rat spawn at the end of a tunnel. I requested with a level 48 last night. I got Jaggars to spawn eventually. Tatterwing bat spawned everytime too. The tatteredwing bat drop nothing and jaggars only droped a +15 mana and +15 endur aug. I killed in this adv for around 3 hours. I have yet to be able to get a group to enter the Hollows but was wondering if there are any Dire Charmable (46) mobs? No there are no DC mobs unless a lower level player gets the expedtion (thus making the average mob level lower and worthless for exp or loot to higher level players). Seeing the notes on the Jaggers Rat, what is the minimum lvl for these Expeditions? Jaggers seems to be lvl 50? So is he just an especially low lvl mob? Was playing Saturday early morning when a system message stated that all instanced zones were coming down for a patch. Notification time was 25 minutes; Estimated downtime was 1 hour. The quote below was originally posted on the Official EQ boards concerning the 09-23rd patch. 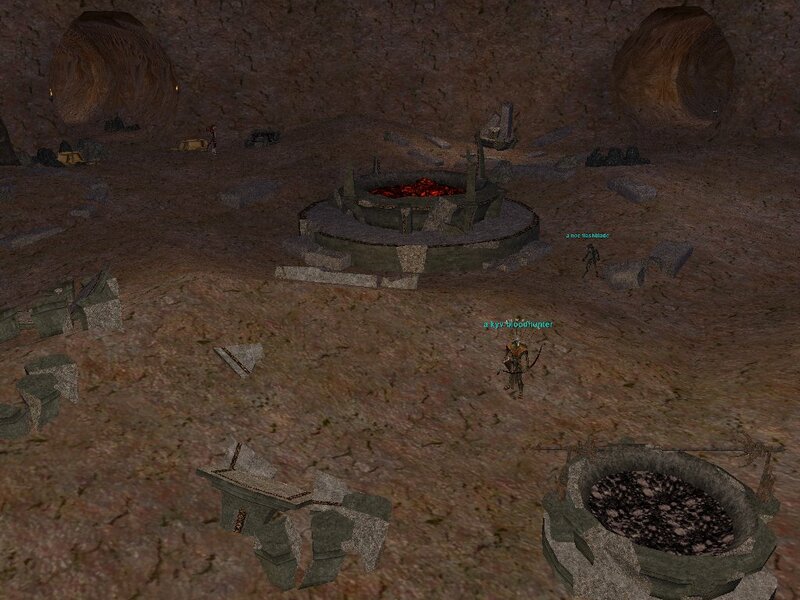 3) The Fire Pits - Level 61 Instance. The thing I noticed after Thursday(?) Nights patch... The Spawn rate on the 61 Level Instance of the Hive has gone from 2-4 Named an hour (Okay exessive I admit) down to about 1-2 Named every 4 hours. While I agree that the spawn rate was a bit high orginally, the adjustment was way to harsh for it to be even close to competitive with other OoW zones. 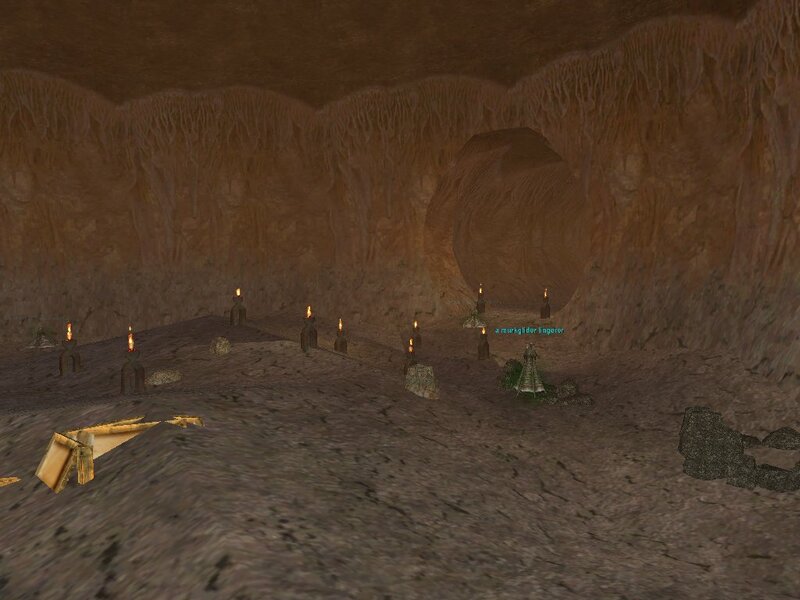 I spent a good 20 hours + this weekend with different groups in the Hollows and saw about 5 named. If not fixed, I'm afraid you will see a lot less use of The Hollows. The XP is BoT level (which is low for the expansion to begin with), the material returns have now been marginalized, the only thing left of any benefit is, you don't have to fight over the camp. Dranik Hollows was once an asset to the expansion, please reconsider the spawn rate on the Named. Hate to see such a nice zone backshelved so quickly. P.S. If you haven't fixed the Lvl 66 Instance of The Hive... please do. If you don't know - The spawn point for the level 70 named is Bugged hard. We spent about 4 hours there, before the last patch, and over that four hours a total of 9 lvl 70 named and 16 lvl 66 Rats spawned and remained up by the end. I pulled one pull to close to the PH/named pile and ended up with 3 Murkgliders and 16 rats in camp. Needless to say, it was funny but frustrating. (I really should have gotten a screenie... nothing like a wall of rats to make you chuckle). We did /bug the PH Problem that night. The bug with the Shrewd Dragorn has been fixed on Test and should be live soon. Also, the spawn rate on rares has not been changed since release. I am glad to hear that they didn't nerf the spawn rate or drops on the Dranik Instanced zones, however I would just like to know what the patch on 10-02 changed, as there was little notice before hand, to my knowledge. I do know that they once again changed the slow mitigation in the Dranik's Hollows Instanced zones. As of 10-01 the mobs mitigated slow again. If you have any info please post here, and I will update this as I learn more as well. Well just spent ~4 1/2 hours in an Expedition killing both PHs got 4 named and no runes. Certainly worse than it has been in the past weeks. I was in one for 2 hours w/o a single named spawnning. (6 PH cycles). Earlier in the week, I would have seen 3-4 named in that length of time. Guess the honeymoon period is over.. Denied! Was in the dranik advs today for 2 hours, had 5 nameds pop with 3 runes dropping. Bad luck, but wish people would quit with the jumpin to conlcusions stuff. I agree. 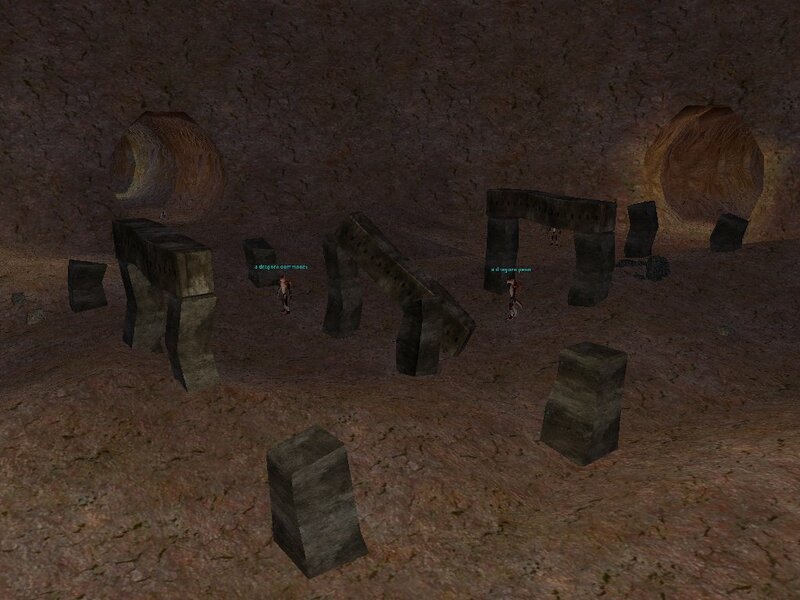 Was in Hive group last night for roughly 3.5 hours and we saw 6 runes drop off of approximately 10 named spawns. If you don't see a named after the 3rd cycle of PHs...just drop the expedition and get a new one. It pretty much seems to be luck of the draw. 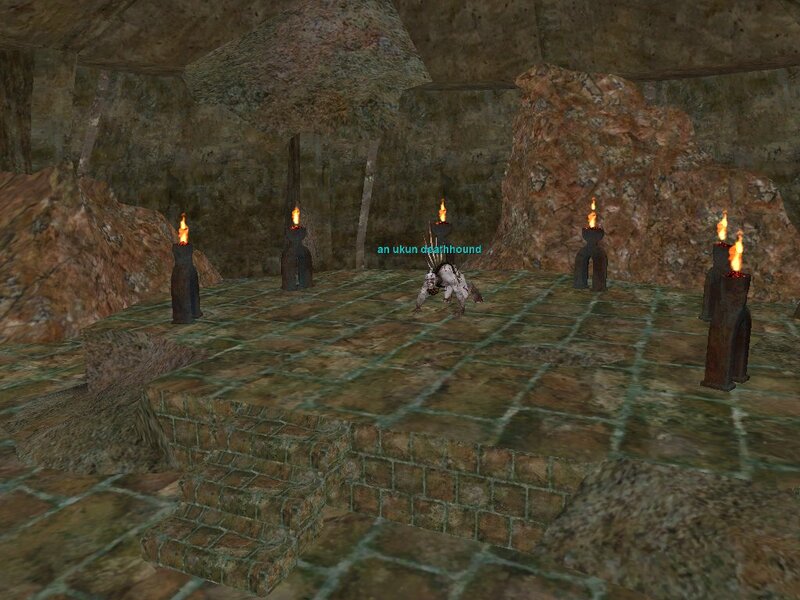 enter fire pit with a level 65 whom triggers the instanced(you'll need 3 people to get instanced but they can disband once u have it) , invis up,roam around till u find the room with the fire pond looking area,look for the a nuc warrior, kill him, wait 15 mnts...kill him...named pops,kill him ,/loot , ETC ETC.. Tried with a level 70 char, monsters were harder like 68 (yellow to 66),nice place as they don't summon..kitting central :D ...but no PH or if there's ph or named they aren't the same in fire pit. 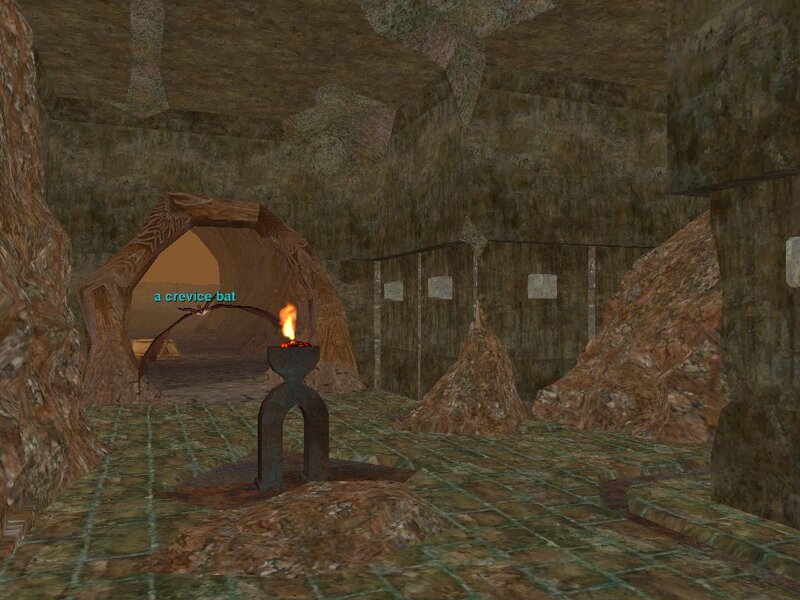 The PH's definetly change position once the person who picks the expedition is level 68...but the names remeain the same...at least for Murkglider zone..Hideous Rat and Tatterwing bat(bat actually was just off the main room, in a short passage). However, we had a Third Named Dragon guy (Shrewd Dragorn) spawn also, from a ph named "A blighted cave rat" who dropped a Two-Toned Signet...No-Drop, no stats, so am guessing it's quest related. These names spawned 2 rooms befor the lower leveled version, in the room with a large outcropping in the middle, with a plant-thing in the middle. 6 rooms in from the zone-in basically. Names were yellow at 68, but not really any harder then the rest of the mobs. The signet is one of the drop required to complete your key to Anguish. I just hope you didn't destroyed it. Something I cant find here is how many people is the minimum to start an instance. I cant get one from the Historian with 3 people. Looks like it may be four.. we did one last night with 63 Mage (me), 65 SK, 65 BST and 65 Cleric (who dinged 66 shortly after we entered). Would have been nice to have had two more but we were able to take care of all we fought though the SK had to split adds a few times and once or twice we stuck pets on one while the SK and BST duoed the other. All in all very nice exp.. we never spawned a named but I got 25% real exp (with all going to EXP) for about 2 hours work. We got a nice augment that added +1% to stun resist then had a chanter friend of mine upgrade it to +3%. The BST won the roll on the upgraded augment. We are definately going back tonight but probably with a full group. I get in with 3 all the time. Don't know why you can't. My setup is 59, 63, 68 in levels and I pull expeditions with those three only in group...daily. I did Murkglider Lair today (actually still there camping named) and the PH and named are popping in the same spot as before. I have gotten the named 3 times so far out of 5-6 PH pops. Everything Boysea said about the murkglider lair was exactly the same experience we had. We also took every avalible left. Killing the PH's (the odd mob out) will either spawn a named or another PH. These did not spawn in the place the PH was killed but rather as a repop to an area we had already cleared or in further where we had not killed yet. We killed for a few hours and got several rat PH's to spawn and the named rat. (a dark scuterrling or somesuch) We killed a few tatterwing bats but only got more of those to spawn and never a named bat so I never did figure out what happens when you do as the historian asks, hence completeing the mission. Enchanter pacify works easily in here and the mobs were easier then a normal Ldon but with perhaps more HP. took awhile to kill each one even with our decent DPS but they don't hit that hard either. (max hit's were 600 or less on our pally) the named rat was no harder then any other mob but it did summon. On a side note one of the people in our group was using a cheater program that shows all spawns in a zone. With our experience and that persons program i would have to say the murkglider lair is all about killing as many mobs as possible in order to get the named to spawn. So if you do not want to be here for hours on end bring ALOT of dps with you and kill as fast as you can. Again....this lair was easier then a "normal" Ldon and it gets boring very quickly. Hmm it seems a little harder than normal LDoN if they hit harder and have more hps, I think normal LDoN mobs hit for 400's? Still some good info though. any level range in these ? Showing 25 out of 51. Click here for the full list.